The strawberry plant is a member of the rosaceae family (as in, roses) along with blackberries, raspberries, cherries, and peaches. Dried strawberries are prepared by immersing whole, fresh strawberries in a sugar solution and then drying to the desired moisture content. 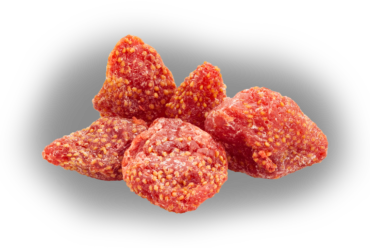 We source our dried strawberries from Thailand. High in vitamin C and truly delicious, dried strawberries have multiple applications, used in jellies, jams, and a variety of desserts — and, of course, sold separately as a snack item.